Claude Buckle's pencil drawing of this famous house accurately reflects the view of the 1930's rather than view one sees today. 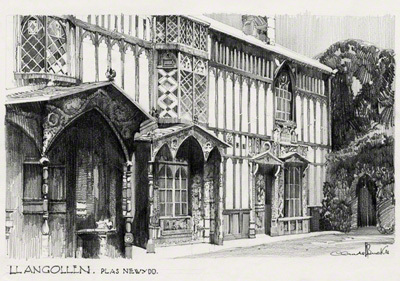 Plas Newydd in the town of Llangollen, Wales, was the home of the Ladies of Llangollen, Lady Eleanor Butler and Sarah Ponsonby, for nearly 50 years. Today, it is run as a museum by Denbighshire County Council. It appeared in the 1989 BBC adaptation of The Voyage of the Dawn Treader (one of the Narnia Chronicles written by C.S. Lewis) as the home of the wizard Coriakin (played by Preston Lockwood). It was also used in a 1987 episode of the TV series Treasure Hunt and Antiques Road Trip in 2013. It was also featured on Most Haunted. Created in 1933.